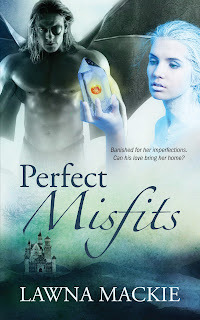 Today we're part of the blog tour for Lawna Mackie's fantasy romance, Perfect Misfits. And one lucky reader will receive an e-copy of Perfect Misfits! He lands in a place he never knew existed and face to face with the woman of his dreams. Labeled a misfit, Tempest was snatched away as a child and imprisoned in the hidden realm of Misfit Mountain. Locked up by Fedor, the ruler of the kingdom who intends to take her as his bride, Tempest has no choice but to brave the dangerous snow and ice of the mountain to escape. Faced with the impossible choice of Fedor or death, love is the last thing on her mind until Ryder snatches her from the air and into a whole new realm of feeling. Interested? The giveaway for one e-copy of Perfect Misfits is open internationally. Fill out the form below to enter!